Welcome. As a career home builder, it has come time to build my final house, a home for my wife and myself. 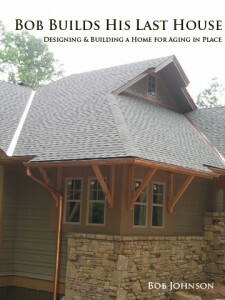 We intend to age in place and are designing the home to accommodate our needs as we grow older. We’ve already bought the lot and are building the first building, a garage apartment. The main house will be built later. Bob Builds His Last House is an update to Bob Johnson’s original book, Houses are Designed by Geniuses and Built by Gorillas, which was published in 1998. This totally new book updates Gorillas to today’s state of the art home building and incorporates Bob’s experiences since 1998. More importantly, Bob Builds His Last House shows how Bob, now in his 60s, is designing his own home for aging in place in the quest to avoid the dreaded nursing home. This book is crammed with straight talk about building a house. Bob Johnson sounds like one who’s been there and done that, and he gives it to you straight, in an in-your-face, no-holds-barred style — as though he’s sitting with you over coffee at the local diner. He holds nothing back, telling you everything you need to know, and more. More than half the book is devoted to matters that need attention before the first nail is driven — everything from siting a house on a piece of land to getting building permits. Bob is also a raconteur. He illustrates many of his points with so-called “war stories” that recount his own experiences on the job. Even within chapters, he doesn’t mind digressing a bit. So, he spices up what could be textbook-dull narrative with his opinions. He tells you flat-out what is stupid and what isn’t, what works and what doesn’t. As a result, this is one of the most readable and entertaining building books I’ve come across.